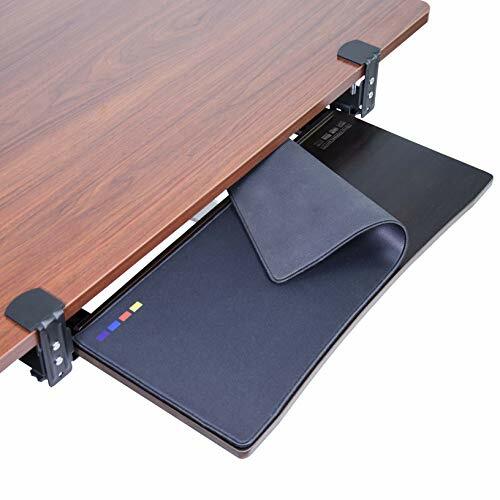 Increase typing comfort while gaining extra desk space with the Stand Up Desk Store Large Clamp-On Retractable Adjustable Keyboard Tray / Under Desk Keyboard Tray. While ingeniously simple in design, it offers a surprisingly long list of features. For starters, the ergonomic keyboard tray offers an adjustable height, so you can achieve the perfect typing position for comfort and the prevention of pain and fatigue. The thumb screw clamps deliver effortless, tool free installation on practically any desk up to 1.5 inches thick. The keyboard shelf has a textured non slip surface plus a chamfered front edge for additional wrist comfort. The retractable design is so the keyboard tray slides out of the way when not in use. The full sized version of our keyboard holder is larger than the compact model, allowing space for a mouse with pad beside the keyboard with additional room to spare. The icing on the cake is positioning the keyboard under your desk frees up space on your desktop for a notepad, paperwork, and more. ERGONOMIC: This adjustable keyboard tray lets you fine tune the height so you can achieve your most comfortable typing position. INCREASES USABLE WORK AREA: The under desk keyboard tray reduces clutter on top of your desk. In addition, the retractable keyboard tray slides out of the way when it is not needed. STURDY: Robust metal clamps and a thick plastic platform with a non skid top surface will ensure this keyboard holder stands up to daily use. EASY TO INSTALL: Thumb screw clamps effortlessly attach to any desktop surface up to 1.5 inches thick, with no tools required. Enjoy the benefits of ergonomic typing angles and a work area that's spacious and extra sturdy with clamp-on keyboard tray (MOUNT-KB05E) from VIVO! Win back valuable desk space by adding a lower tier surface for the keyboard, mouse, and other small items. 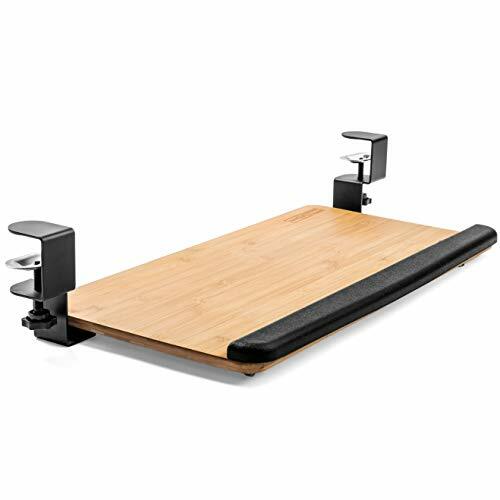 Designed with user-geared features such as smooth gliding motion for easy placement, sturdy C-clamps for convenient mounting, and anti-skid padding for scratch resistance, this mount was built to perform! The solid steel track construction makes this mount extra sturdy and guaranteed to last. The under-desk tray placement creates an ergonomic setup that decreases fatigue and muscle strain on the neck, back, and shoulders. The sleek, black appearance adds a classy look to any office while providing ample support for your keyboard and accessories. All hardware is provided for easy installation to get your tray mounted and organized in no time! 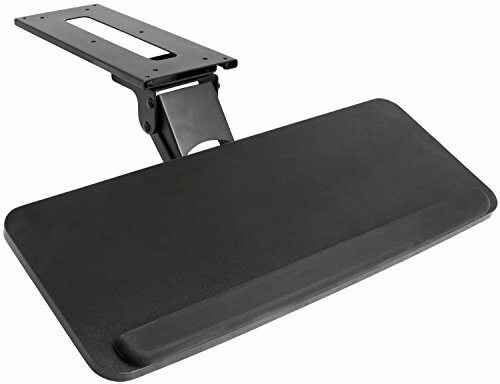 SOLID CONSTRUCTION - This 26.8" x 11" under-desk keyboard tray is designed to hold weights up to 11 pounds and provides excellent support for your keyboard, mouse, and other small accessories. SMOOTH GLIDING MOTION - Easily slide the tray in and out for convenient keyboard placement. 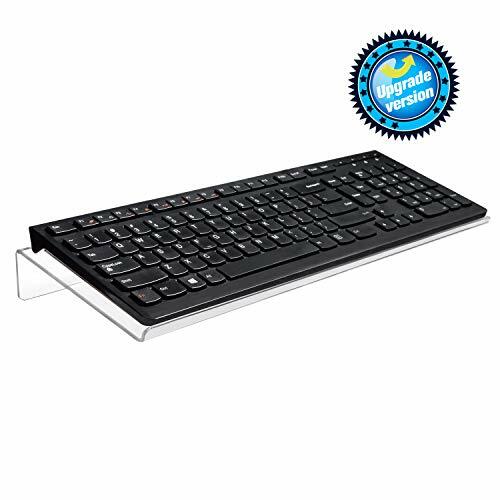 Extends a maximum of 9.5 from the edge of your desk and keeps your keyboard below the desk surface for ergonomic typing that relieves stress on the wrists, neck, and shoulders. 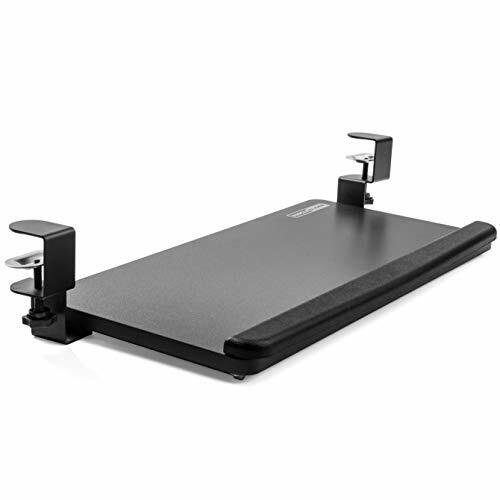 STURDY C-CLAMPS - Attach the keyboard tray to your workstation without causing any damage to your desk (2.1 MAXIMUM DESK THICKNESS) with sturdy C-clamps that hold everything tightly in place and are easily adjustable for user convenience. Before purchasing, please make sure that your desk surface does not exceed a thickness of 2.1. WE'VE GOT YOU COVERED - This product is backed with a 3-YEAR MANUFACTURER WARRANTY and friendly tech support to help with any questions or concerns. Stand up and type more comfortably with the adjustable height & angle WorkEZ Keyboard Tray. This ergonomic stand up keyboard riser properly positions keyboards and mice to optimize your typing posture. Raise keyboard to elbow-height and type with a neutral or negative tilt for optimal wrist health. 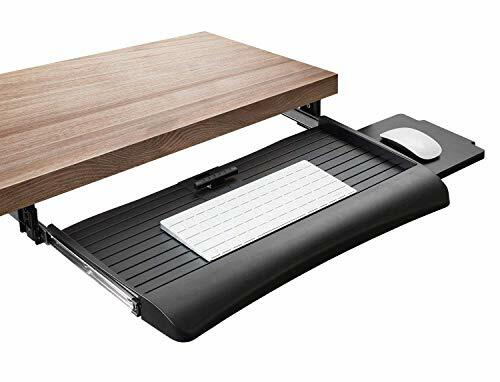 Excellent as both a seated and adjustable standing desk keyboard tray, it s a simple, convenient way to elevate and tilt keyboards for a more comfortable typing experience. Includes 2 pieces: 1. KEYBOARD TRAY: * Wide Panel: Approx. 18" left-to-right by 11 front-to-back panel comfortably holds most keyboards and gives ample room for wrist support. * Negative Tilt Panel rotates and locks in 15-degree increments, letting you type with a flat- or downward-angle for optimal wrist health. * Adjustable Height Position keyboards at almost any height from flat on your desk up to ~18"" high - perfect for standing. * Material: Lightweight, durable aluminum. 2. MOUSE PAD * Holds mice in perfect alignment with the keyboard * 7x7"" size is large and comfortable * Connects to the left or right side of the panel * Easily adjust the mouse pad's angle * Material: Lightweight, durable aluminum The WorkEZ Keyboard Tray & Mouse Pad is an ideal adjustable, ergonomic computer keyboard stand that elevates keyboards to a comfortable typing height and has a tilting panel for enhanced typing comfort. It s the perfect standing desk keyboard tray & a simple, effective keyboard stand that can improve your posture and comfort when typing. The WorkEZ Keyboard Tray was designed by and is exclusively manufactured by Uncaged Ergonomics. We work hard to innovate useful, affordable and effective ergonomic office products and welcome your feedback. ADJUSTABLE HEIGHT KEYBOARD STAND: Raise keyboards to almost any height from flat up to 18 tall! The ideal adjustable height stand up computer keyboard holder. ADJUSTABLE MOUSE PAD: Large ~7x7 mouse pad easily and quickly connects to either the right or left side. Mouse pad angle is adjustable independently of the keyboard tray's angle. Whether you are want to clear up space in your office/home or want to improve your posture and back pain, our Clamp Keyboard Tray can be your best friend. ERGONOMIC BENEFITS/NO DAMAGE TO EXISTING DESK - Using your keyboard and mouse at the same height level as your computer can cause back pain and body stress. Our ergonomic clamp keyboard tray is positioned at the exact height under desk for optimal long term use and fatigue reduction. Our clamp system also allows use WITHOUT damaging your desk. SAVE SPACE (LARGE SURFACE) - We know that you want room for your hands to rest comfortably on your keyboard tray and mouse and be able to use in full motion without having to sacrifice space. This is why we created our extra-large and wide tray that measures 26" x 11"
SMOOTH GLIDING TRAY - Ever have a keyboard tray that seems like it needs some lubricant because it keeps getting stuck or not going in and out smoothly? Well, you don't have to worry about that with your Defy Desk Keyboard Tray. With our sturdy C-clamps, solid wooden tray, and premium stainless steel side rails, you can make sure that your tray will NOT shake! FITS MOST DESKS - The Defy Desk Keyboard Tray fits MOST desks that are wider than 32 inches (most desks). Unlike other keyboard trays that REQUIRE a thickness of 1.5 inches or less, our tray does not have a minimum and can extend up to 2.4 inches thickness to serve all types of tables and desks. 100% MONEY-BACK GUARANTEE - Defy Desk products are backed by 100% guarantee that you are fully satisfied with your product or receive your money back, because customer satisfaction is our #1 policy! To start using our Keyboard Tray for your health, click on 'Add to Cart' on the top right to proceed! ERGONOMIC BENEFITS/NO DAMAGE TO EXISTING DESK - Using your keyboard and mouse at the same height level as your computer can cause back pain and body stress. Our ergonomic clamp keyboard tray is positioned at the exact height under desk for optimal long term use and fatigue reduction. Our clamp system also allows use WITHOUT damaging your desk. Just clamp on and use instantly! SAVE SPACE (LARGE SURFACE) - We know that you want room for your hands to rest comfortably on your keyboard tray and mouse and be able to use in full motion without having to sacrifice space. This is why we created our extra-large and wide tray that measures 26 x 11 (not including clamps - which measure 32 in total). Now you can REDUCE clutter by tucking your bulky keyboard and mouse ALL THE WAY, freeing up the top of your desk. 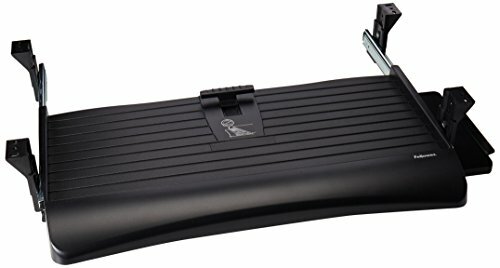 SMOOTH GLIDING TRAY - Ever have a keyboard tray that seems like it needs some lubricant because it keeps getting stuck or not going in and out smoothly? Well, you don't have to worry about that with your Defy Desk Keyboard Tray. With our sturdy C-clamps, solid wooden tray, and premium stainless steel side rails, you can make sure that your tray will NOT shake and it will go in and out smoothly! FITS MOST DESKS - The Defy Desk Keyboard Tray fits MOST desks that are wider than 32 inches (most desks). Unlike other keyboard trays that REQUIRE a thickness of 1.5 inches or less, our tray does not have a minimum and can extend up to 2.4 inches thickness to serve all types of tables and desks, in addition to hanging 3.5 inches below the surface of your desk for maximum comfort. 100% MONEY-BACK GUARANTEE - Defy Desk products are backed by 100% money back guarantee that you are fully satisfied with your product or receive your money back. Please contact us if you experience any issues, because customer satisfaction is our #1 policy! We will make sure you are satisfied with all our products! UNDER DESK KEYBOARD SHELF: Free up desktop space and create a less cluttered more efficient work area with our sliding keyboard platform. It offers ample keyboard and mouse space while stowing away when not in use. 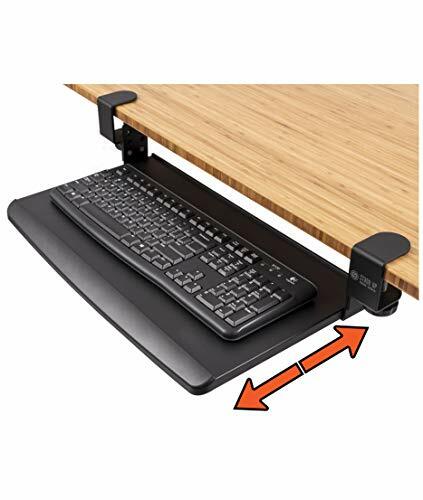 SLIDING KEYBOARD DRAWER UNDER DESK: Thanks to smooth steel ball bearing glide tracks, it easily slides out for use and back under the desk when not in use. HEIGHT ADJUSTABLE: It can be installed at 3 different height levels to suit the optimal keyboard height comfort. ERGONOMIC: Locating your keyboard and mouse lower than the monitor and desktop allows you to position your elbows and wrists in optimal angle, to help prevent carpal tunnel and other injuries. MOUSE PLATFORM: Dedicated mouse platform can be installed on the right or left side of the keyboard platform. Increase typing comfort while gaining extra desk space with the Stand Up Desk Compact Clamp-On Retractable Adjustable Keyboard Tray / Under Desk Keyboard Tray. While ingeniously simple in design, it offers a surprisingly long list of features. For starters, the ergonomic keyboard tray offers an adjustable height, so you can achieve the perfect typing position for comfort and the prevention of pain and fatigue. The thumb screw clamps deliver effortless, tool free installation on practically any desk up to 1.5 inches thick. The keyboard shelf has a textured non slip surface plus a chamfered front edge for additional wrist comfort. The retractable design is so the keyboard tray slides out of the way when not in use. The compact version of our keyboard holder is narrower and shallower than our full-sized version, allowing it to fit under desks with limited space, or to work well with other accessories. The icing on the cake is positioning the keyboard under your desk frees up space on your desktop for a notepad, paperwork, and more. 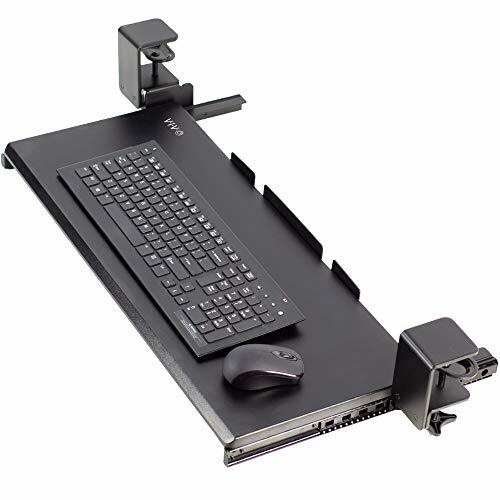 3M Adjustable Keyboard Trays help place your keyboard and mouse at proper level to increase comfort and productivity. AKT60LE has a knob adjust arm that controls both height and tilt - just loosen knob, set height and re-tighten. Adjusts height to 1" above mounting surface and 4.5" below mounting surface. Standard all-in-one platform with wooden construction minimizes bouncing. Includes all-in-one leatherette gel wrist rest with antimicrobial product protection and Precise Mouse Pad that can be placed on right or left of keyboard. Lifetime warranty on arm, five years on platform, and one year on gel wrist rests. Contains 70% preconsumer recycled content. Black. Raise, tilt, swivel and slide computer keyboards to the perfect position with the KT1 Ergonomic Under Desk Keyboard Tray. KT1 is an industrial-grade, adjustable keyboard tray packed with ergonomic features and the simple adjustability you need for optimal typing comfort. De-clutter your desk, type more comfortably and improve your posture with the KT1 Under-Desk Keyboard Tray. Built for durability, this under-desk keyboard tray is designed to withstand the most rigorous office environment and is engineered for optimal ergonomics. KT1 features a single lever that simultaneously adjusts keyboard height (from 4.5 below to desk-height) and tilt. KT1 swivels left and right and slides completely under your desk. 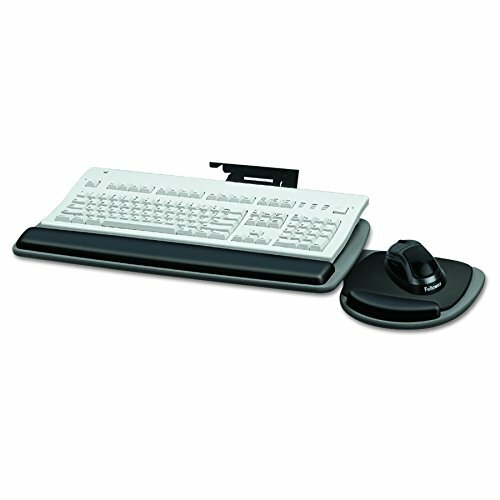 KT1 Ergonomic Keyboard Tray s mouse pad connects to the right or left and is independently adjustable in angle, which allows your mouse to be level even if you re typing with a negative tilt. The distance between your mouse and keyboard is adjustable to optimize shoulder posture. KT1 includes a non-skid keyboard panel to secure keyboards and a rubber mouse pad. ** KEY FEATURES: ** 1. ADJUSTABLE HEIGHT: From 4.5 in. below to desk level. 2. ADJUSTABLE TYPING ANGLE: Promote wrist health by typing with a neutral or negative tilt. Non-skid grips keep your keyboard in place! 3. SWIVELS: Easily swivels left & right 4. SLIDES UNDER YOUR DESK: Smoothly slides in and out and tucks completely under your desk. 5. ADJUSTABLE MOUSE PAD: Connects to the right or left. Independently adjust the mouse pad s tilt and width. Rubber mouse pad included. 6. EASY INSTALLATION: KT1 has a quick, intuitive installation process SPECS: 1. Keyboard Panel Dimensions: 18.5 x 8.75" 2. Mouse Pad Dimensions: 7 x 8.75 3. Rail Length (mounts to your desk): 16 4. Material: High Strength Steel + Premium Laminate Properly position keyboards at a comfortable height & angle with the KT1 Ergonomic Under-Desk Keyboard Tray! EASY ASSEMBLY: Set up your new keyboard tray in 5 minutes! No need to put holes in your existing desk or crawl under your desk! Your new keyboard tray will clamp on your desk in seconds. The entire unit is 33 inches with clamps included. The tray itself is 27.5 inches. 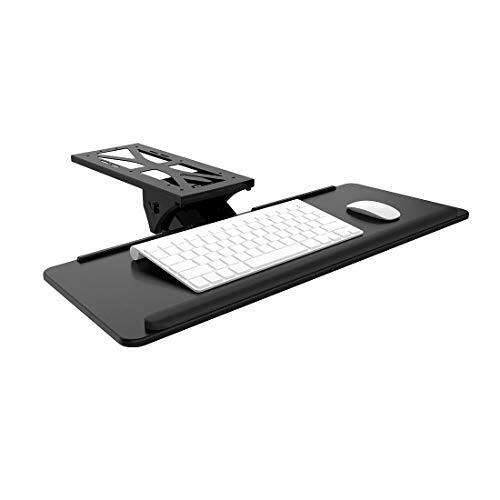 SMOOTH GLIDING TRAY: Slide your new keyboard tray under your desk and out of the way - when not in use. When you need the extra space simply pull out the keyboard tray and start using it instantly! FITS MOST DESKS: The Stand Steady Keyboard Tray will fit most desks that are wider than 33 inches and have a thickness of 1.5 inches or less. Tray will not work with beveled-edge desks. Tray will hang 5.75 inches below the surface of your desk! EXTRA LARGE SURFACE: This is one of the largest and most spacious desk trays on the market! With a 27.5 x 12.25 surface you can fit your keyboard, mouse, and all your extra knick-knacks. ERGONOMIC DESIGN/ NO DAMAGE TO EXSISTING DESK: Your keyboard tray has a very modern sleek design. It's easy clamp on feature (with padding!) means no damage to your existing under desk. With your comfort in mind, it has an ergonomic beveled edge to decrease the pressure on your wrist. Enhance your typing posture with an ergonomic adjustable keyboard that mounts to the bottom of your desk. 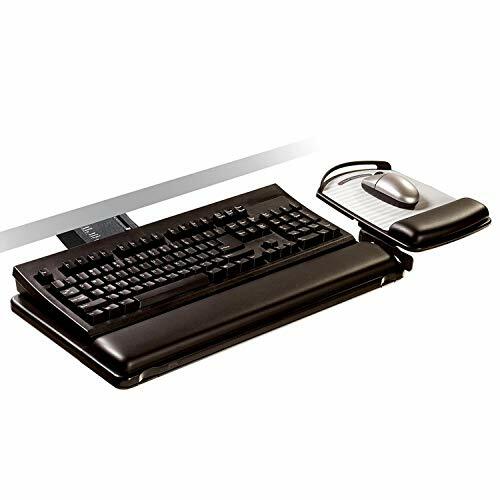 MOUNT-KB03B is a deluxe 25" x 10" under table mount designed to fit both keyboard and mouse of varying size. Features include plush wrist padding to help reduce wrist soreness, height adjustment within a 5" range, and full side to side rotation for optimum keyboard placement. The keyboard slides forwards and back on a 13" track. Assembly is a simple process and we provide all the necessary hardware to get your deluxe keyboard mounted. **Important Note** - Total weight of the keyboard tray is 10 pounds. Be sure your desk can support the under-mounted 10-pound tray plus keyboard weight. ErgoActive Keyboard Drawer and Wrist Rest Combo Pack will bring a new level of comfort to your desk! 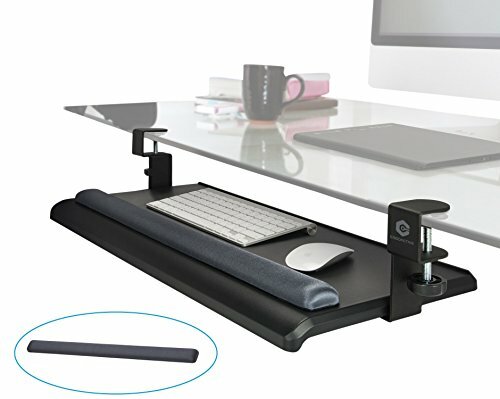 The keyboard tray helps to bring your keyboard and mouse down to chair arm-rest height for an optimal ergonomic position, while the gel padded keyboard wrist rest enhances overall comfort during long periods of working at your computer. 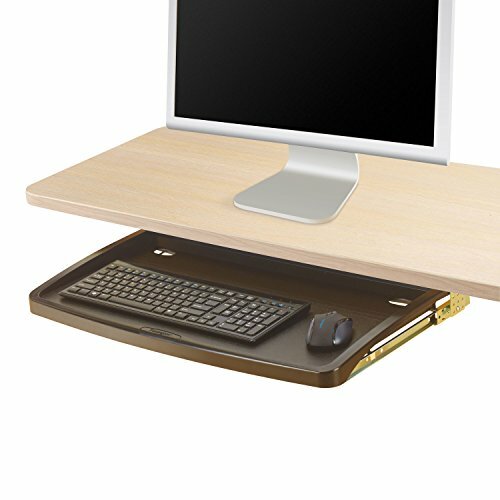 The extra large under desk tray fits both a keyboard and mouse at the same time, thereby maximizing space and comfort. The sliding rail design ensures that the drawer slides smoothly forwards and backwards. Unique clamp attachment design allows for easy tool-free installation without the risk of damaging your desk. Keyboard tray size: 70 x 31cm (27.6 x 12.2 inches) / Tray sits 12cm (4.7") below your desk's top surface. NOTE: Including brackets the unit is 82.5cm (32.5") wide, thus please ensure that your desk is adequately large to fit the full unit (tray + clamps). Combo Pack includes: 1 x Keyboard Tray, 1 x Gel Wrist Rest. NOTE 1: Including the table clamps, the entire unit is 32.5" (82.5cm) wide - thus please ensure that your desk is large enough to accommodate the tray and table clamps. NOTE 2: Keyboard tray does not fit a curved desk - installs securely only on straight edged desks. KEYBOARD TRAY & WRIST REST COMBO PACK - Combo package includes keyboard tray and keyboard gel pad wrist rest. Get the most comprehensive and comfortable ergonomic keyboard solution with the keyboard tray plus wrist rest combo pack. The gel pad keyboard wrist rest is ultra confrontable and has been specifically designed to fit perfectly with our extra large keyboard tray to ensure an optimal ergonomic set up for your office desk. 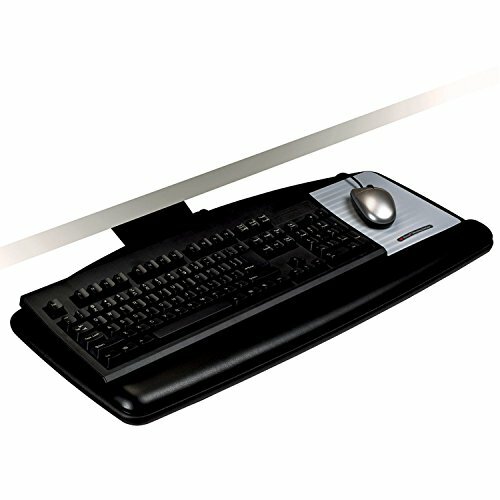 EASY TO INSTALL - Ergonomic under desk sliding keyboard tray easily installs in under 5 minutes. Tool-free installation with built-in sturdy metal clamps which fit most desks up to 40mm / 1.57 thick and is easy to install without tools or screws which could otherwise cause surface damage to your desk. NOTE: Keyboard tray does not fit a curved desk - installs securely only on straight edged desks. 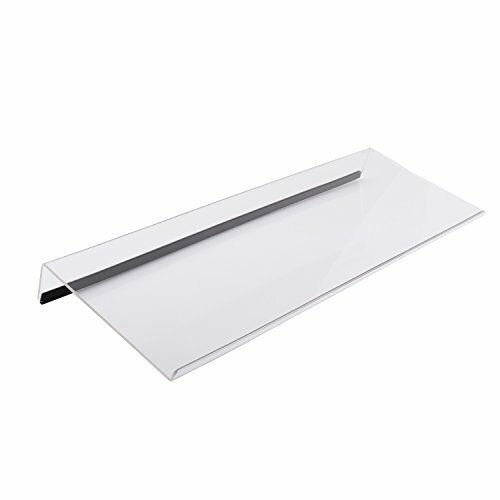 SLIDING TRAY - Retractable smooth sliding rail design ensures the desk drawer slides smoothly forwards and backwards. Easily slide the tray under your desk when not in use, and instantly pull it out when you need extra space. Tray sits 12cm (4.7) below your desk's top surface. 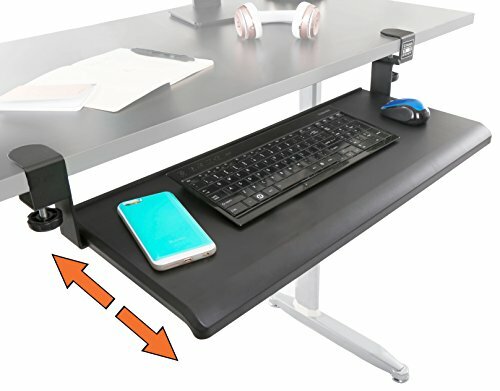 EXTRA LARGE SURFACE - Under desk keyboard tray with extra-wide surface fits both a full size keyboard and mouse comfortably with extra room to spare for your phone and other items. Large desk drawer adds valuable additional work space to your office. 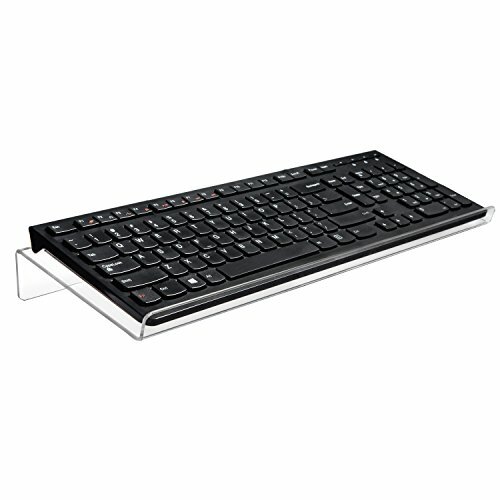 Keyboard tray size: 70 x 31cm (27.6 x 12.2 inches) NOTE: Including brackets the unit is 82.5cm (32.5) wide - please ensure that your desk is large enough to fit the tray and table clamps. - Product Size:Approximate(W*H*D) 17" x 1-1/2 " x 5.5"
STABLE - The keyboard holder with humanized design for a seamless fit, will keep keyboards stable, you will not worry the issue of sliding any more. Work Better, Easier, Faster and with Unmatched Comfort with the #1 Ergonomic Computer Keyboard Stand with RUBBER STRIP by First-Rate Acrylics! Is your body showing you signs of fatigue due to long working hours in front of the computer? Are you fed up with poor quality, flimsy keyboard stands that cause more problems than they set out to solve? Do you need an extra durable keyboard stand that has been flawlessly designed to prevent muscle strain and overexertion and make computer work a breeze? Then look no further, because we have exactly what you're looking for! 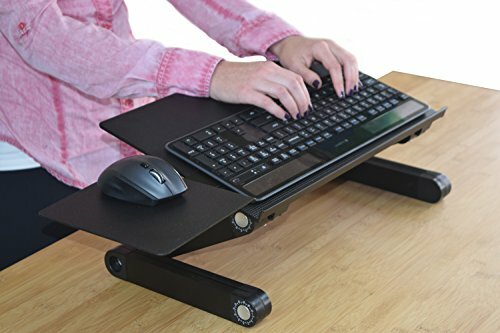 Designed by the world's top engineers, this tilted computer keyboard stand will make sure to reduce tension on your arms, wrists, neck, and shoulders and make daily work easy and comfortable! If You Think That All Keyboard Stands Are Created Equal, Think Again! Save Yourself Money and Hassle with a Safe PurchaseThat You Won't Regret! When it comes to your health, you cannot settle for anything less than the best! Most computer keyboard stands on the market don't deliver on their promises. Why? Simply because they are not ergonomically engineered to reduce muscle strain and maximize productivity, causing serious musculoskeletal problems in the long run! Dimensions: 17" WIDE x 1 " High x 6" Vertical Backed by a 100% money back guarantee, you have nothing to lose! SAY GOODBYE TO MUSCLE STRAIN & FATIGUE: Relieve tension from the wrists,forearms and elbowsand protect your body from unnecessary neck and shoulder issues that can seriously affect your health and productivity. OPTIMIZE YOUR WORKDAY: Whether you're working from home or at an office, this premium quality, ergonomic keyboardstand will make long working hours in front of the computer a breeze! Dimensions: 17 WIDE x 1 High x 6 Vertical. Rear tilt: 1 . FrontTilt: . UNBEATABLE STYLE: Boasting a special, scratch-free protective film on both sides, polishedfinish and smooth, rounded edges, this tilted keyboard riser will instantly add sophisticated class to your spaces. LOVE IT OR YOUR MONEY BACK: Backed by our risk-free, 100% money back policy, you have nothing to lose! Eliminate arm and wrist pain while working on your desk or we'll refund your purchase in full! What could you lose? 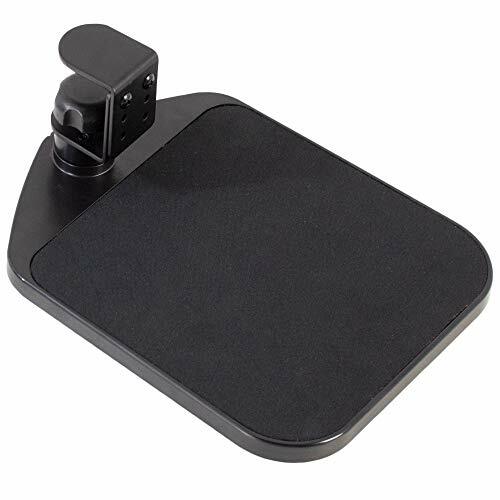 Click away in comfort with Desk Clamp Mouse Pad (MOUNT-MS01A) from VIVO! This adjustable 9.8" x 7.7" platform creates ergonomic angles for your wrist and provides additional space for your mouse and other small items. Elegant black fabric lines the top surface for optimal comfort and traction. The sturdy desk clamp attaches to any surface up to 2" in thickness for versatile placement, fitting regular office desks, tabletop risers, and more. The clamp also makes it easy to mount and unmount the mouse pad with no damage to your existing desk. Designed for both right-handed and left-handed users, this product accommodates your dominant hand with ease. Full 360 rotation means flexible placement for your wrist, as well as easy storage by rotating the tray under the desk surface when not in use. Minimal assembly is required out of the box, and all necessary hardware and instructions are provided to get your new mouse pad improving work processes in no time! Desktop Thickness: Clamp fits surfaces up to 2"
Product Dimensions: 9.8" x 7.7"
ROTATING DESIGN - Find just the right angle for your wrist as well as ideal placement for the 9.8 x 7.7 platform with smooth 360 rotation. This flexibility also creates space efficiency, since the tray can rotate under the desk when not in use. 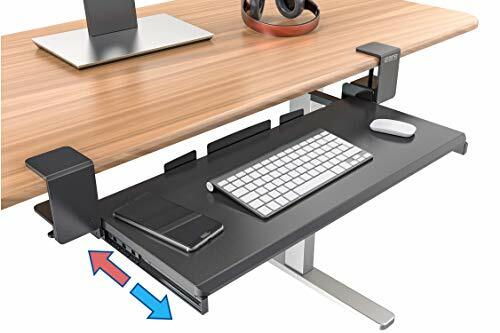 EASY MOUNTING - The sturdy desk clamp attaches the mouse pad to your desk surface (up to 2 in thickness) with no tools required and no damage to your existing desk. The clamp tightens into place for a stable setup allowing smooth motion for adjustments. VERSATILE - When it comes to left or right handed users, this mouse pad is everyone's friend. Use your dominant hand proudly by placing this platform wherever you need it. To reduce clutter, the tray can also hold other small items like pens, keys, phones, and more. The vision behind Jungle Slider is to transform the desktop experience by bringing simple, clean, elegant organization to your home or office environment. We challenged conventional thinking and redesigned the traditional bolt-on sliding keyboard tray for added convenience. The Jungle Slider keyboard tray is designed with style in mind, yet we do not sacrifice in ergonomic comfort. We understand the high impact of improper posture, and for that purpose, we have built in a durable wrist wrest for proper position and to eliminate hand fatigue. One of the biggest challenges of earlier model keyboard trays was the necessity to bolt on the hardware, making your keyboard tray a permanent fixture to your desk. We solve that problem with our easy to install clamp-on technology. You can rest assured you will not need a handy person or power tools to install your Jungle Slider. Additionally, your Jungle Slider is portable and is interchangeable between workspaces. Our vision would be incomplete if we did not solve the main problem we set out to fix: how to extend the existing workspace without creating clutter? With its extra-large surface at 25 x 12 inches, the Jungle Slider is ideal for the majority of your desktop components. In addition to that, our specialty patented slider rail smoothly tucks away your keyboard and mouse pad when not in use. 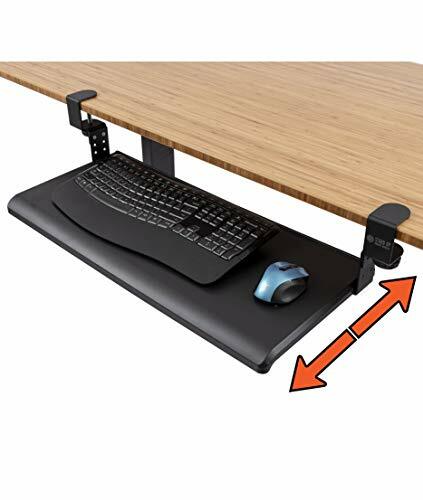 The entire length (end-to-end desk surface space) needed to install the keyboard tray is 30 1/2" The clamps can clamp on to a desk as wide as 2" The length of the board spans 25" x 12" The height of the space below the desk for your keyboard and mouse is 2 3/4" The entire fixture hangs below the desk at 4 1/2"
NO DRILLING REQUIRED: This keyboard tray clamps on within seconds! Excellent desk/table organizer. STYLISH & ERGONOMIC: Smoothly tucks away like an under desk shelf. BONUS: Built-in wrist rest. 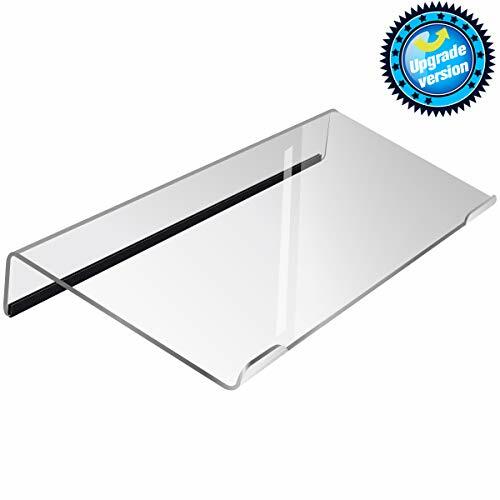 EXTRA LARGE SURFACE: Expand your desk space and clear the clutter with this 25x12 desk extension. HEAVY DUTY: We start by sourcing the highest quality materials and craft them into a work of art. 100% MONEY-BACK GUARANTEE: Our friendly support team is ready to answer any questions you may have. Enjoy custom comfort and easy space management with the fully adjustable Fellowes Keyboard Tray! Simply grasp and rotate keyboard tray to your preferred work position. Use a single knob to adjust the height and tilt for individual comfort. Both keyboard tray and mouse tray include soothing gel wrist supports. Mouse tray mounts to either right or left side or stows underneath for easy storage when not in use. SPACE SAVING - Whether you have a small or large desk, it is always important to utilize the space wisely to get the most out of your work. This computer keyboard tray will instantly increase your space since it sits beneath the desk you are working on. PLEASE NOTE, THIS KEYBOARD TRAY HAS A TRACK THAT MEASURES 5.4 IN WIDE AND 18.2 IN LONG. PLEASE ENSURE YOUR DESK HAS ADEQUATE SPACE FOR THE TRACK TO CONNECT TO. Enjoy working by an easy way. Feeling tired due to long working hours in front of the computer? What to change this condition? Here is what you are looking for! Refrze committed to producing high quality products for customers. This type of acrylic keyboard stand is designed by the Team of World Class Ergonomists can eliminate tension from the wrists, forearms and elbows due to long working hours in front of the computer and protect your body from unnecessary neck and shoulder issues that can seriously affect your health and productivity; As well as improving typing and help reducing painful mistakes. According to customers advices, we made this upgraded one. 1.Make the front lip on the end lower. Your fingers won't touch the front lip means no hurt on your finger. More comfortable and safer. 2.Added soft Anti-Slip Strip. Fixed your keyboard perfectly and protect your table at the same time. What's more, we have 100% money back guarantee, no need to wait now. Get it now. Function: The acrylic keyboard stand can eliminate tension from the wrists, forearms and elbows due to long working hours in front of the computer and protect your body from unnecessary neck and shoulder issues that can seriously affect your health and productivity; As well as improving typing and help reducing painful mistakes. Upgraded Anti-Slip Strip and Convenience No worry about the slide anymore. We added a soft Anti-slip strip, which means no slide and protect your table at the same time. You keyboard will fix on the acrylic keyboard stander stably. No need to install, you can put it anywhere you want. The acrylic keyboard will be a great partner for your work and life. Service: We provide 100% satisfaction guarantee. We make sure that all the products are in good condition before shipping, if the acrylic keyboard stand has some problem when you received it, please contact us directly. We would love to send you a new one. Our goal is to make our customers happy. Convenience No worry about the slide anymore. You keyboard will fix on the acrylic keyboard stander stably. No need to install, you can put it anywhere you want. The acrylic keyboard will be a great partner for your work and life. If you are a gadget lover- our electronics catalog is your dream destination. Choose from hundreds of gadgets and accessories to suit different uses and add some entertainment- facility and convenience to your life. Large platform provide enough space for both keyboard and mouse. Lift/Release function and Positive/negative tilt are supported on the mechanism, making it easy to adjusting the tray to the perfect position. Slides under the desk allow you stow the keyboard tray completely underneath the desk. Unlike many light-weighted plastic keyboard tray, this extra large ( 27.5 inches by 12.5 inches) keyboard tray with 100% sustainable natural bamboo wood base - strong and durable - to extend your home or office workstation space. The reinforced heavy-duty steel clamps and base support with laser cutting, precision bending and stress reinforcement makes this under desk keyboard tray clamp on extra sturdy and comfortable. With the industrial grade sliding mechanism, it has the smoothest sliding in and out comparing to other keyboard trays, not to mention its durability and lasting quality. The entire tray overall size: 33.5 inches with clamps on. Recommended desk size at least greater than 34 inches. Size of the platform/keyboard tray is 27.5 inches by 12.5 inches. Two level adjustable clamps for desk thickness up to 3 inches. A full-sized high-quality customized keyboard and mouse pad included for best comfort and working experience. With sustainable solid bamboo wood platform (natural or walnut/espresso color finishing), plus thick steel heavy duty clamps, and industrial-grade slide mechanism to smooth slide in and out, all together this keyboard tray brings your working experience to the highest level. This carefully pre-installed keyboard tray only needs minutes to put clamps on, tighten and done. Super easy to set up. No screws into desktop, non-skid pad, perfectly protect your desk in every way. Please carefully review all the listing information before purchase, and feel free to reach out and send us emails for any question you might possibly have. 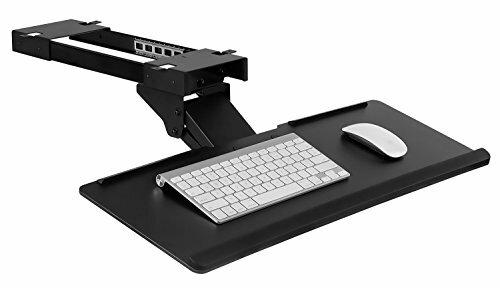 ERGONOMIC WORKSPACE EXTENSION - Extend your desktop with a large under desk keyboard tray clam on, set up a perfect height for your elbows and body position, releasing the stress from carpal tunnel, shoulder, and back. 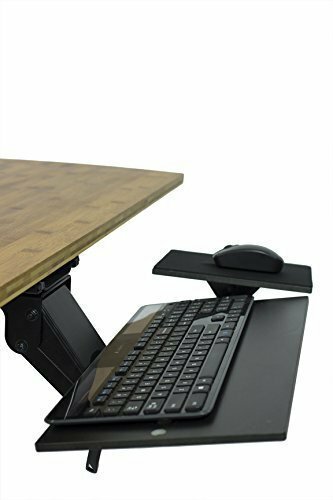 Adjustable height (2 levels) to easily fit almost all desktop thickness, it also allows larger/higher distance between surface and desktop to maximize usable working area. STURDY / HEAVY DUTY / NO PLASTIC - with sustainable solid bamboo wood platform (natural or walnut color finishing), plus thick steel heavy duty clamps, and industrial-grade slide mechanism to smooth slide in and out, all together this keyboard tray brings your working experience to the highest level. MINUTES SET UP / NO SCREWS INTO DESKTOP / NO DAMAGE ON DESKTOP - this carefully pre-installed keyboard tray only needs minutes to put clamps on, tighten and done. Super easy to set up. No screws into desktop, non-skid pad, perfectly protect your desk in every way. DIMENSION & USABLE AREA - the entire tray overall size: 33.5 inches with clamps on, recommended desk size at least greater than 34 inches. The actual size of the platform/keyboard tray is 27.5 inches by 12.5 inches. A full-sized high-quality customized keyboard and mouse pad included for best comfort and working experience. QUESTIONS & CUSTOMER SUPPORT - Please carefully review all the listing information before purchase, and feel free to reach out and send us emails for any question you might possibly have. Or post your questions and ask other great buyers to comment and share great information.